Sandra Kaye: Welcome to my HAPPY place!!!! Love your wall color! In a previous studio, I painted the walls apple green. It makes all the treasures pop! 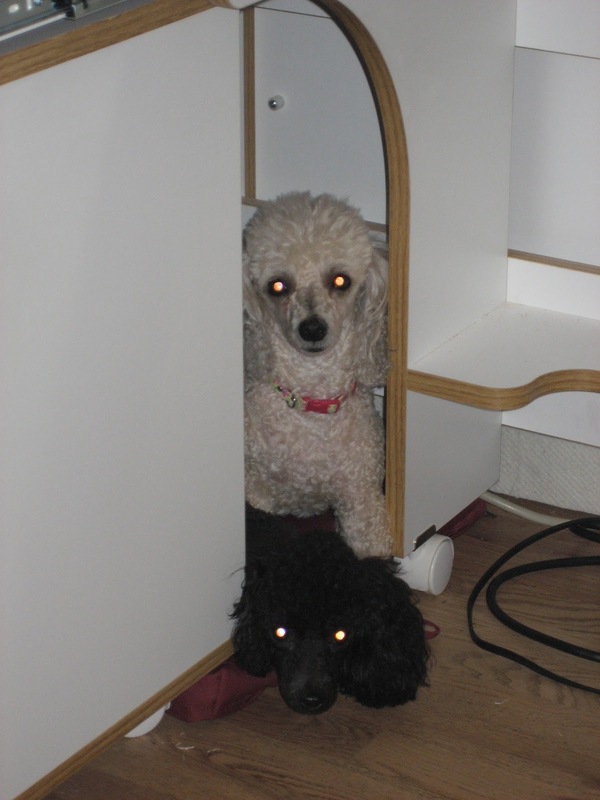 It's so funny how your little dogs found a place to "kennel." Your space is sooo cheerful! 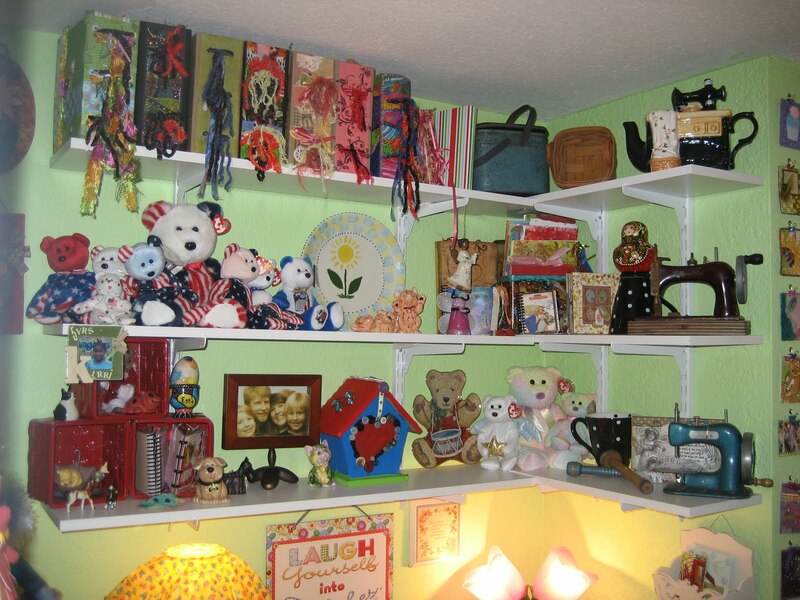 I felt myself smiling about every nook, cranny & drawer. Your children are beautiful!! 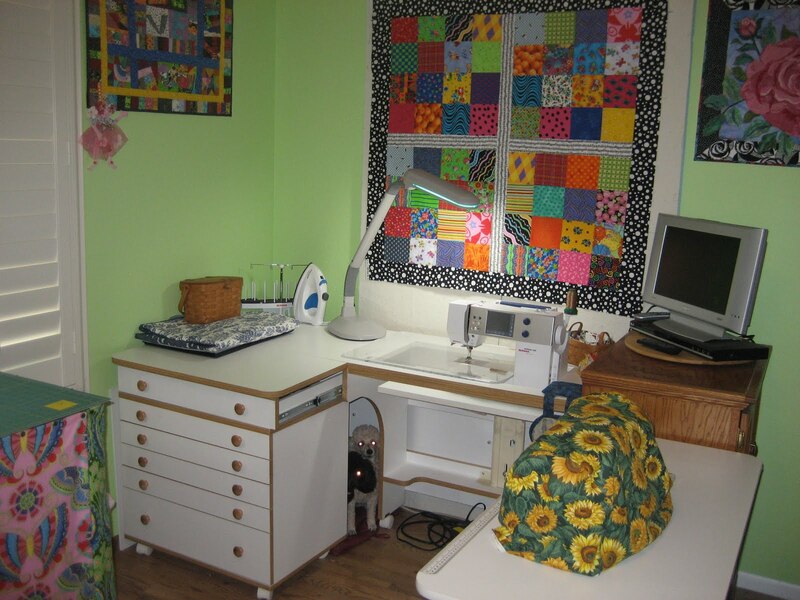 Thanks for stopping by my blog to see my quilts and other good things! I DO love to quilt. I'm not doing the studio tour. I am gone 13 hours most days at work & commuting, so I tend to leave things "in progress" -- not so neat looking! 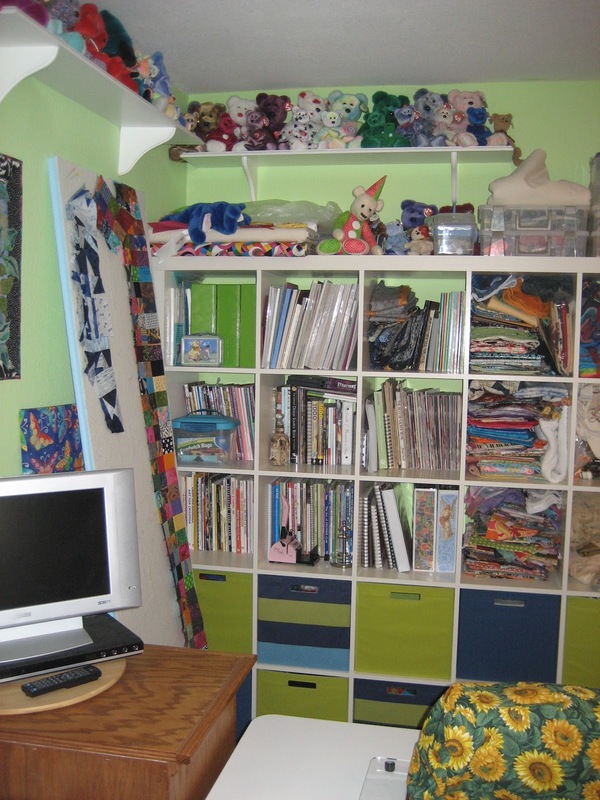 Your studio looks divine and very organized since you do so many varied types of art. Nice to "meet" you! I love the color of the walls ! The roof in my lampwork studio is that color! 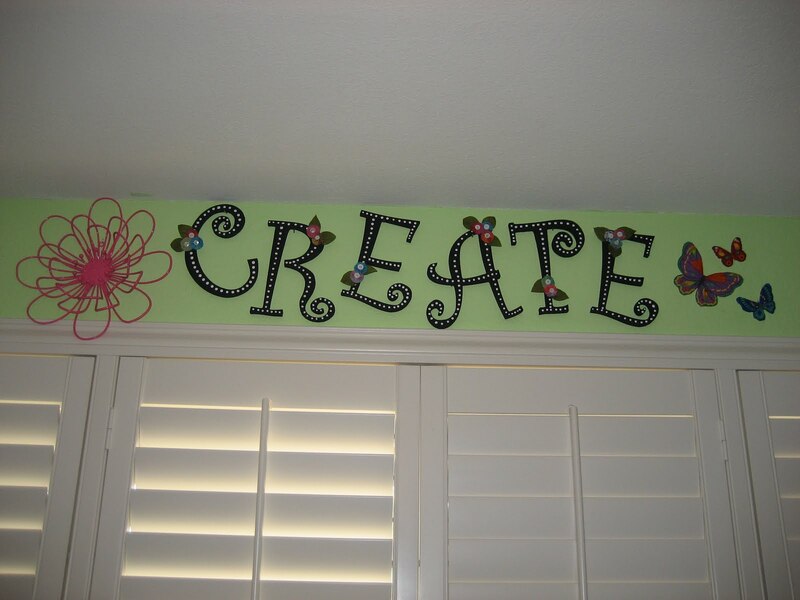 I hope you can visit my little creating spots when you have time! Hello my friend. I feel so happy that I get to play with you in your "happy place". You have done such an amazing job setting up that space in a very short period of time. It looks like it's been there for years!! Love you girlfriend! Have fun meeting everyone and finding great blogs out there! A closed in dining room with a 14 foot closet?! How lucky can a girl get! How nice of your family to help you set it up in the new house, first thing. 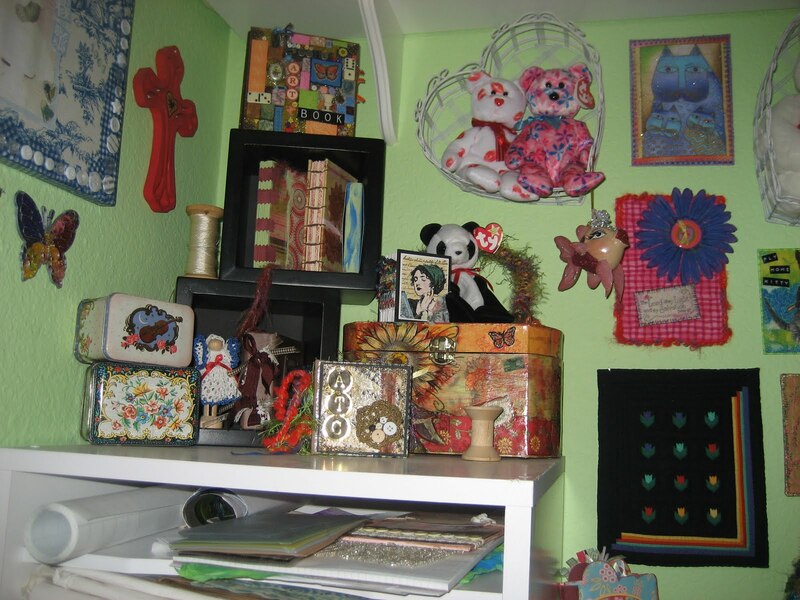 I've sorted through my good junk, but I still need to get it cute looking. Wow, I really enjoyed all your pictures! That is Organization with a capital O. I wish I could be that way. 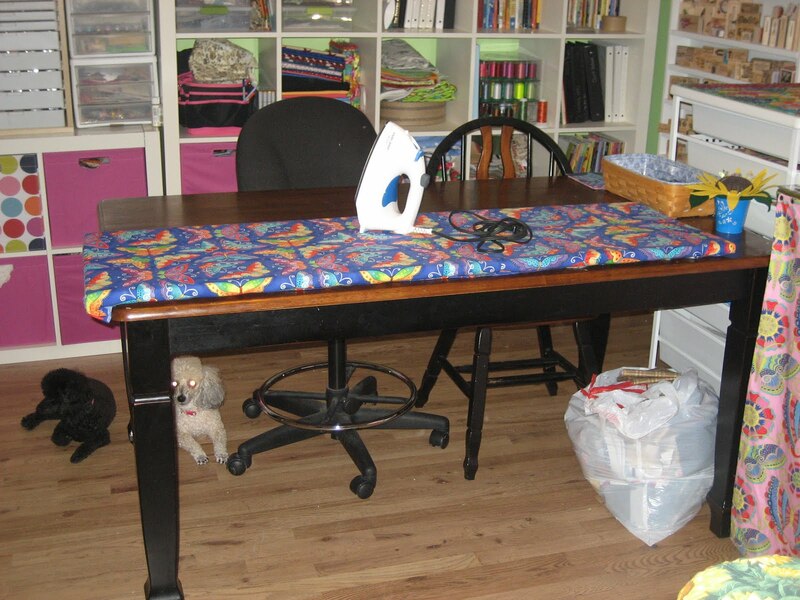 I love your sewing machines! Everything is wonderful! Your happy place is wonderful! Love how you've intergrated such fabulous color and how the place is so organized. thanks for visiting Thistle Cove Farm; please come back soon. WOWZA !!! that is a fabulous space. 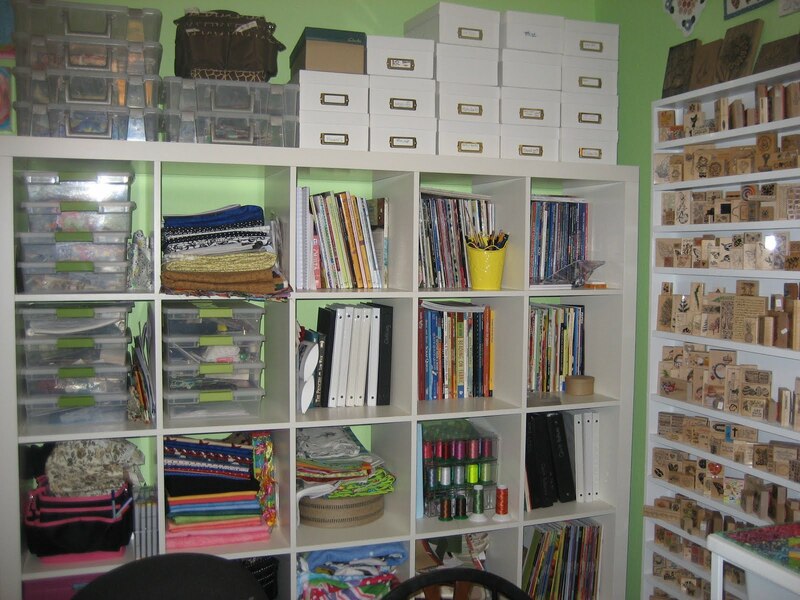 You are wonderfully organized but the room is still inviting. I looove the colors. Love, Love, Love your Happy Place! The colors are great, and so many pretty things to take in. Your 'hand crank' sewing machine caught my eye - I recently found a 1914 hand crank Singer I had to bring home with me. I love to think about the woman who probably made wonderful quilts and clothing for her family on that old machine. O MY GOODNESS!!! You do have ALOT of CREATive stuff!!! And it is ALL so organzied.. I love the color green on your walls. All your stamps and fabric.. O MY!! Wished we lived closer, I would enjoy creating in your AWESOME space. Thanks for sharing and visting me.. Blessings! 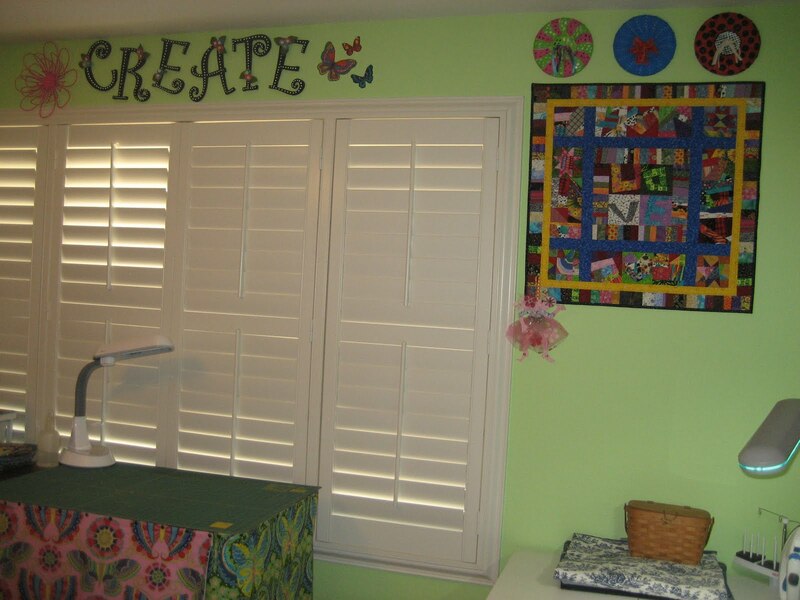 I can see why you call it your happy place, it is so cheerful and looks like so much fun to create in! Everything is so nicely organized too :D Thank you for sharing! 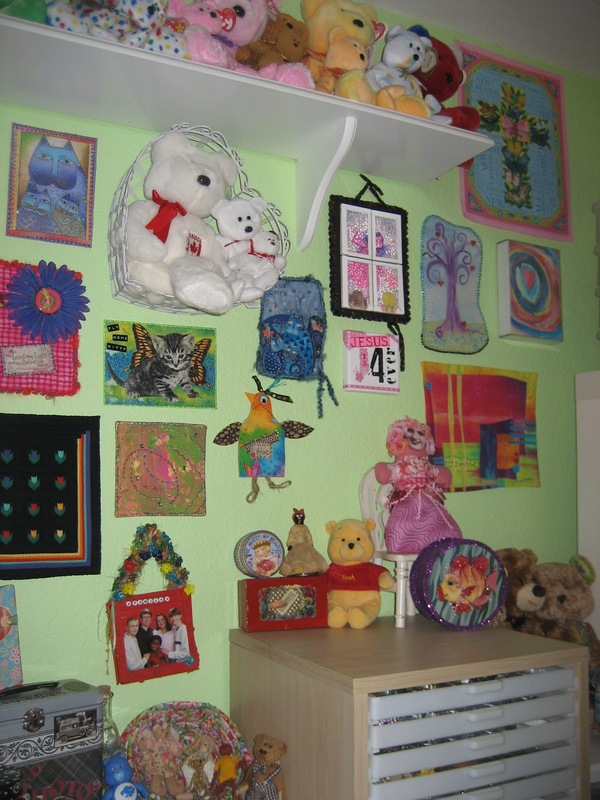 That really is a happy room you have Sandie - so bright and wonderful. Love all your stamps and fabric. You have a very nice set up for your art space. 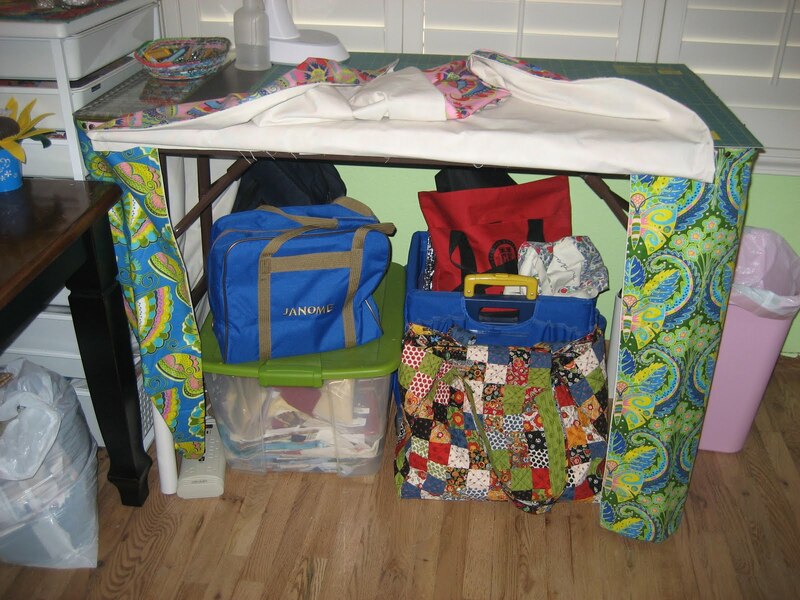 Lots of storage and lots of fabric. Plus I spy a couple vintage sewing machines. Would make me happy being in there. a colorful space! You are giving me the urge to get up and go create instead of looking through the rest of the WBC blogs! WOW Lucky girl you! 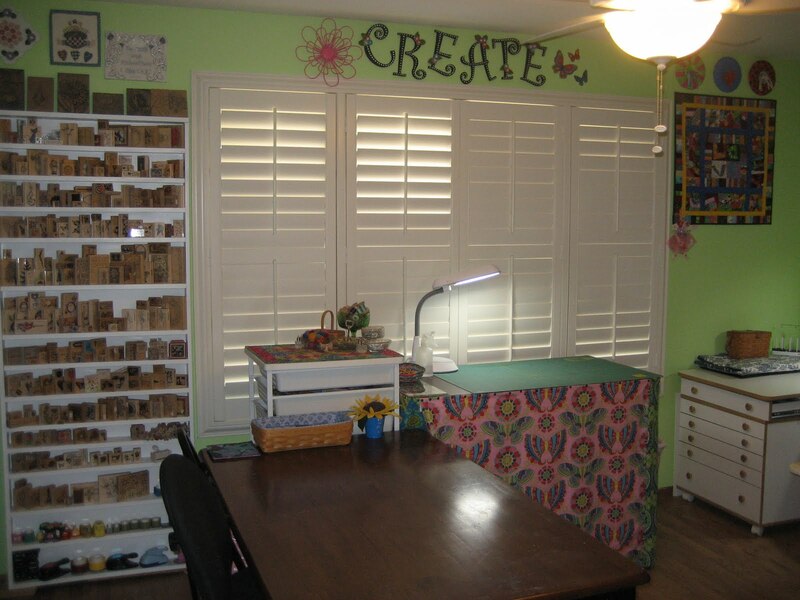 I love your creative space - it's wonderful!! And your story about "Mom's happy place" is just adorable. We all need that! Loved seeing your sweet doggies. Every studio needs one... or two! Thanks for sharing. I'm following you now so we can keep in touch. I love your studio. I especially love your nice organizers. Where did you get the one with the drawers with tiny compartments. I need that really bad. I'm a textile and fiber addict..err collector also. 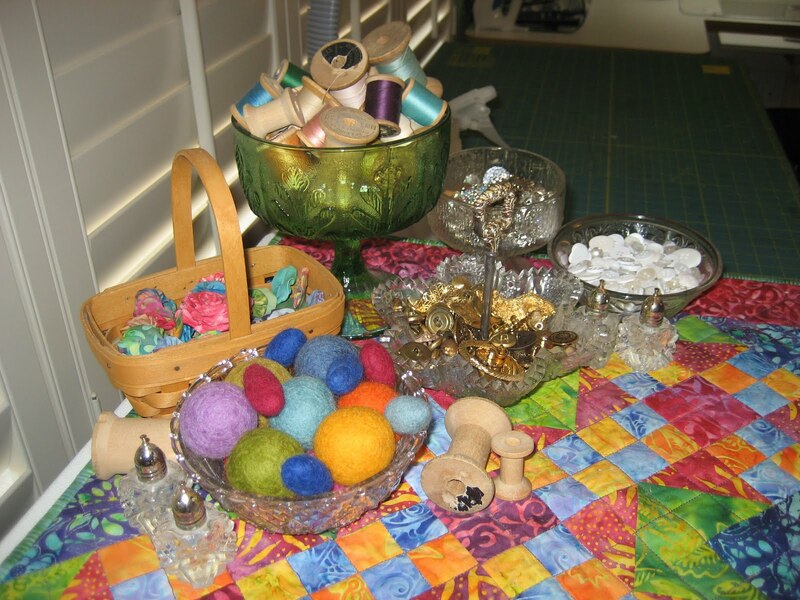 :0) So NO we can never have too much fabric or yarn or thread. So much beautiful colour! Thanks for showing us your happy place. 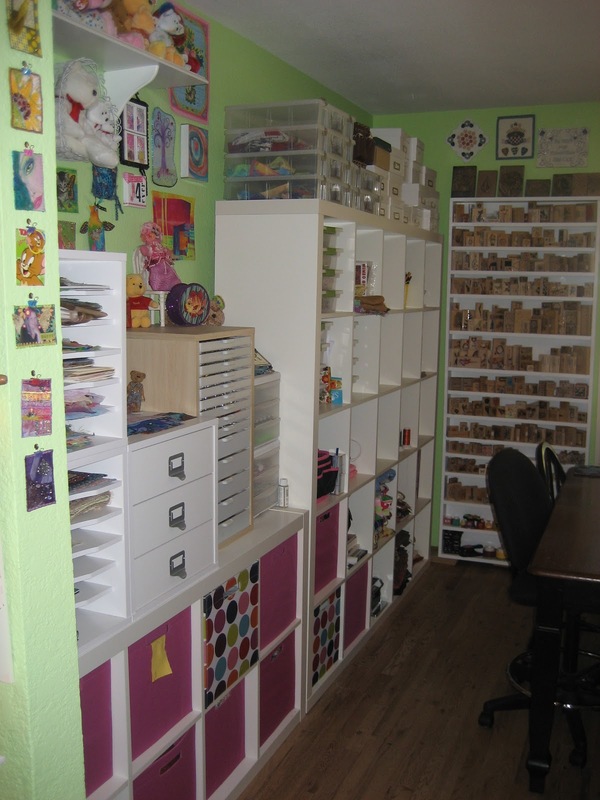 Whay a great organised space. I love it! 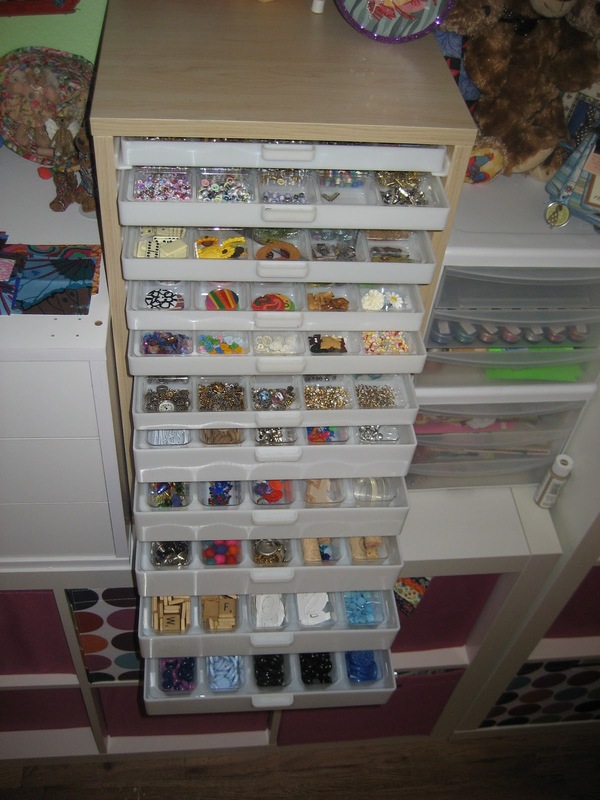 i nneded inspiration for storage and found it on your post. Such a very happy, colorful, and productive studio you have. I love it. You must have everything under the sun in there to create with too. Oh Sandie, I want to be one of your gorgeous furbabies! They live in heaven!!! I could spend hours looking at your wonderful pics and ... I always find something new and inspiring! Thanks for the fabulous tour through your enchanting world! You have a wonderful creative space...it's no wonder it's your Happy Place. 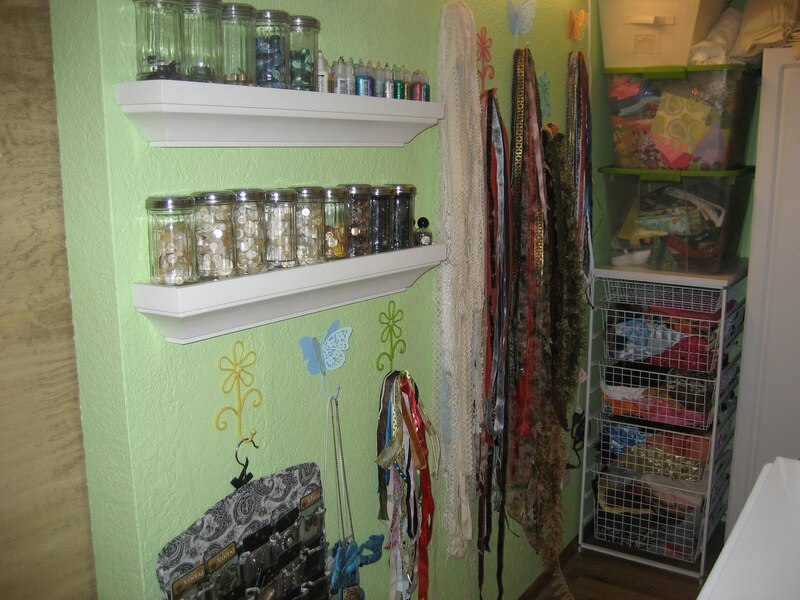 I love youur sewing corner! I love the infusion of color in your studio. I would love to just dive in and swim in all those colorful fabrics! And your storage is phenomenal! I can see why this is your happy place. Thank you for sharing. I love the colour you've chosen for your studio walls ~ beautiful! WOW! You are so organized, it is just amazing. Well done and thank you for sharing! Sounds like you have a smart, understanding hubby! I love your space! You have packed so much into it and it looks so organized. I also love the color green on the walls - such a cheery, happy place. Thanks for sharing it with us! Hi Sandie! Thanx so much for coming to visit me (literally) and I have enjoyed my visit to yours. Let's get together. I love your new art space. I love color as much as you do. Your blog is awesome. I will post a link to you and you can do the same if don't mind. Hope to se you soon! 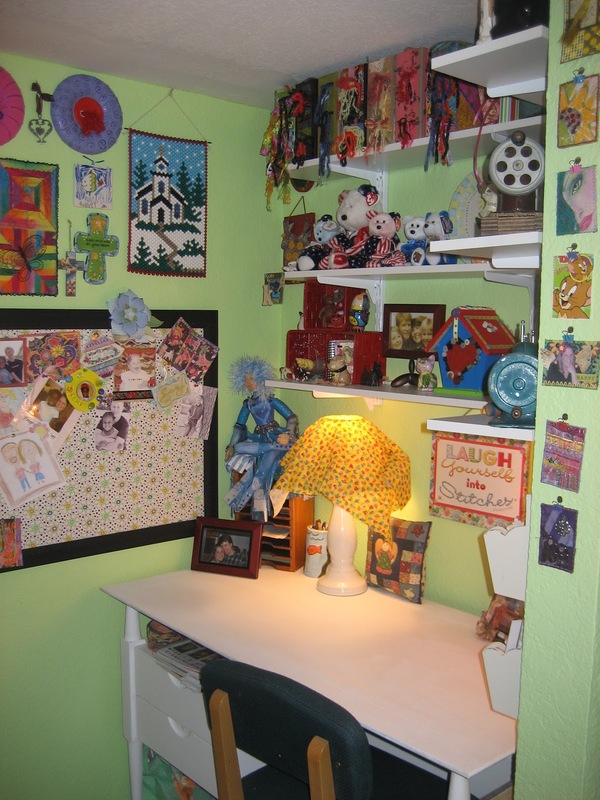 What a fantastic bright and cheery place to create in!! Love the wall color and all of the other bright colors you have displayed through out this great room!! And you are definitely organized!! Thanks so much for the tour!! Great Space ! Thanks for the tour. And thank you for your sweet comment about my dogs. Your Zoey and Daisy are so adorable. Oh the fun we would have if we lived near each other. Your space certainly makes me happy. So bright and beautiful. You are one organized lady! Thanks for sharing, loved it all. Truly a creative and happy space. 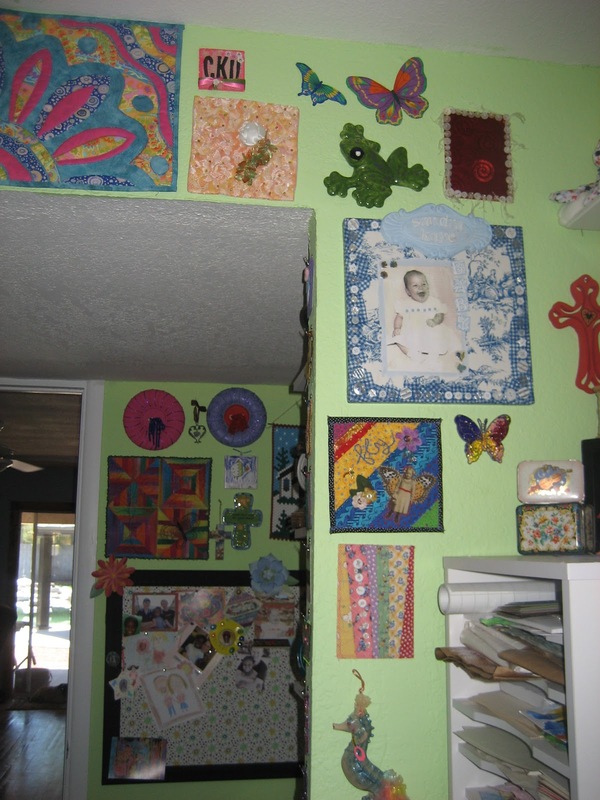 Thank you for such a delightful tour..love the green walls which only add to the bright and cheeriness of this art room. TFS!!! Thanks for visiting my blog! I do enjoy hibernating in there on weekends. Love your room! It is so organized and FULL of goodies! Love those cubbies! And your furbabies are adorable! Thanks for stopping by my blog the other day! Love to have visitors! Love your happy place. It is so organized, looks like everything has it's place. Thanks for taking a tour of my happy place. Hope you are enjoying your family visit. COLOR, color and more color! It was fun to see your wonderful workspace. And your blog background is perfect for you and your love of color! Wow looks like everyone agrees with me ~ LOVE IT !!! Can't wait to see it in person!!! 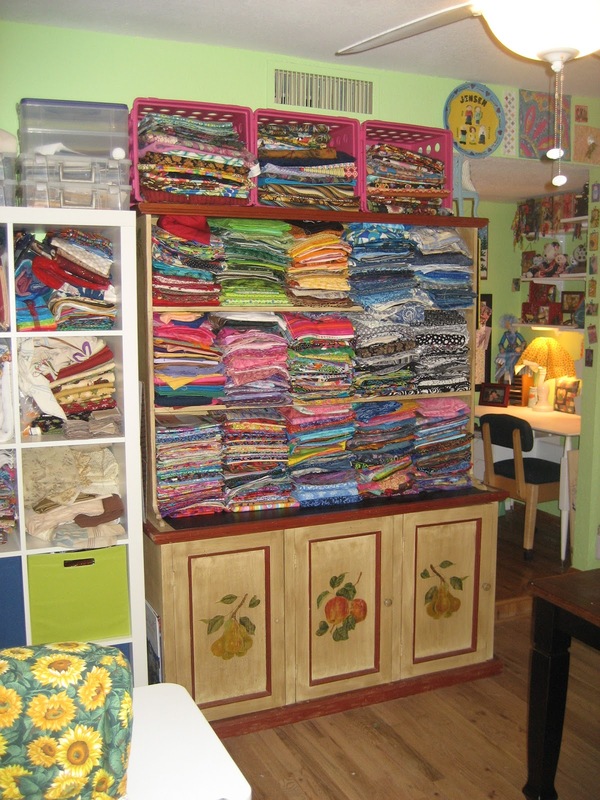 What an amazing space and your fabric stash is swoon worthy! Love the fur babies too! Your studio looks great!! you should send pictures into Studio Magazine!! I love the mint walls! Such a happy space! And I cracked up to see your babies hiding in the corner there!! So cute! A locely space! Hi Sandie! I love how colorful your studio is. I can see why it makes you happy. You are so organized. That is something I need to work on. Love Ikea! Your furry babies are so cute. 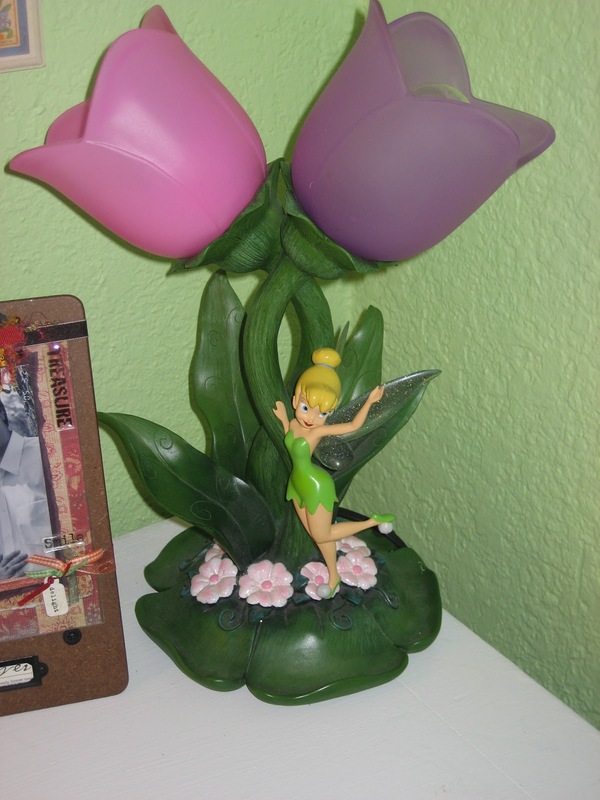 Oh and I think your lamp is great. Thank you for visiting my studio and I hope you visit again soon. Hi Sandra, I love, love, love your space. I'm so glad you visited and left a comment! I am a new follower and I took your button to put on my blog roll. 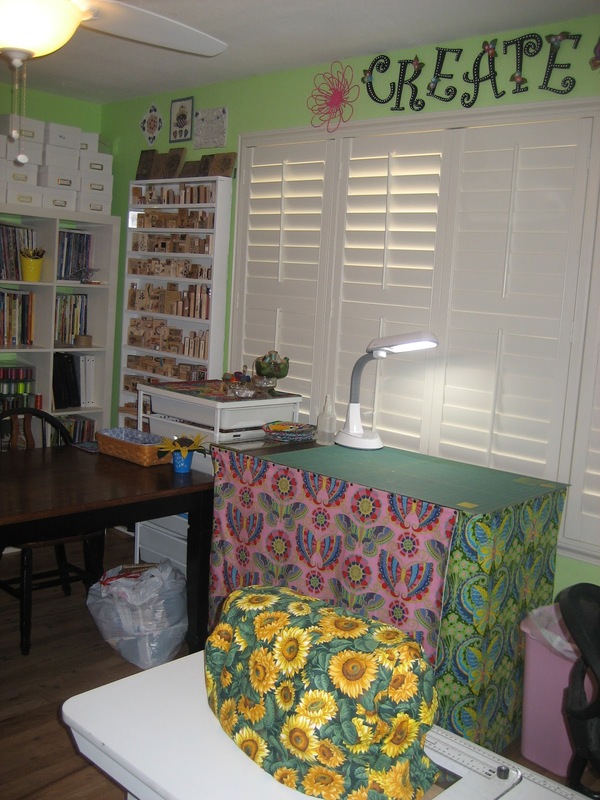 I think you have a lovely blog and your studio is wonderful! I adore your space! 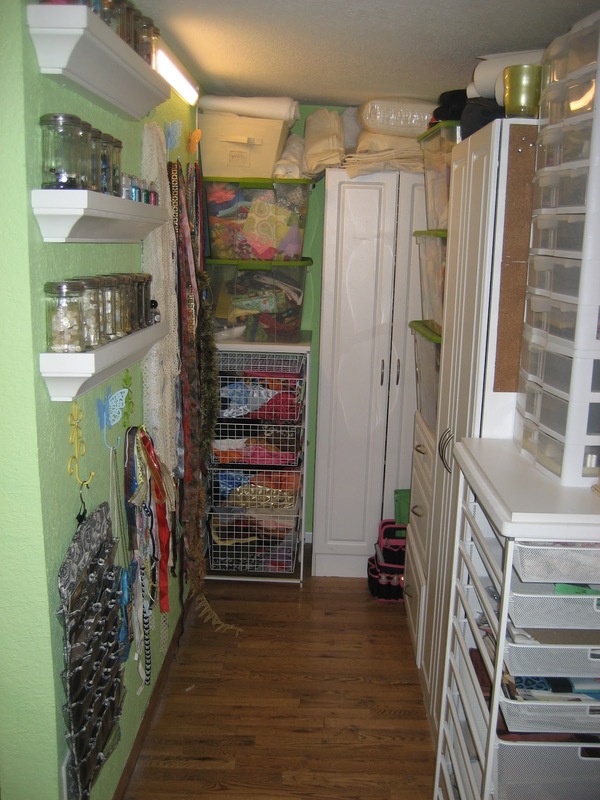 Your "closet" is so very organized, I love all the containers and the rubberstamp shelf your husband made for you; just beautiful! Thank you so much for the tour of your adorable space and thanks for sharing some of your art. Well I will make it 50 comments for you. 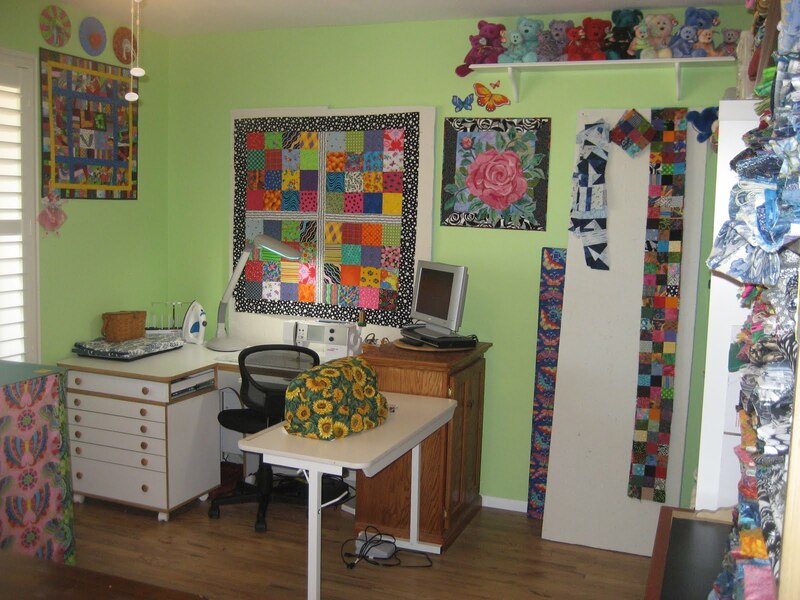 Your space in the new home is fabulous, just like your quilts. 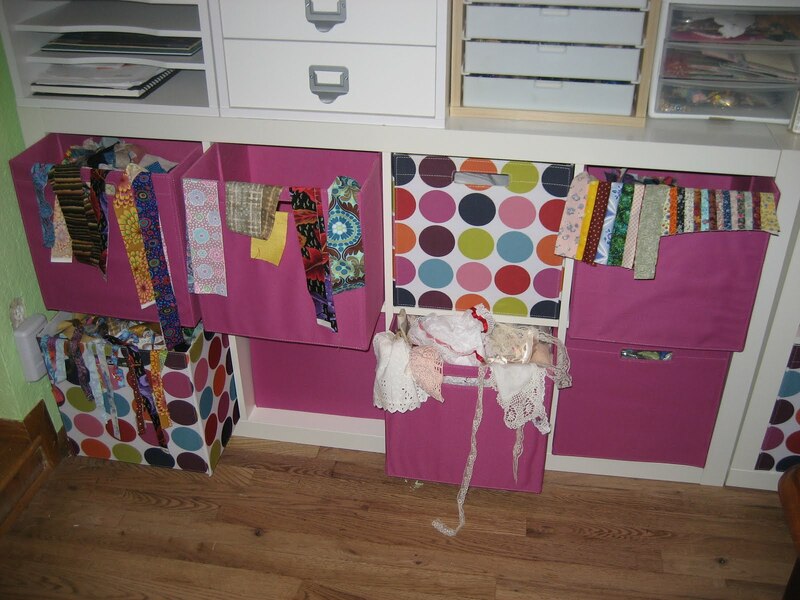 Love the cabinet with the fabric as I too am a fabric lover. Walking in a fabric store for me is like walking into a candy store for children. Good luck with your new home in Arizona and also love all the color, makes it a happy place. What a colorful fun place. I love the hiding place for your little puppies! Thanks for sharing! I love your studio. I'm just in the organizational stage of moving into mine. 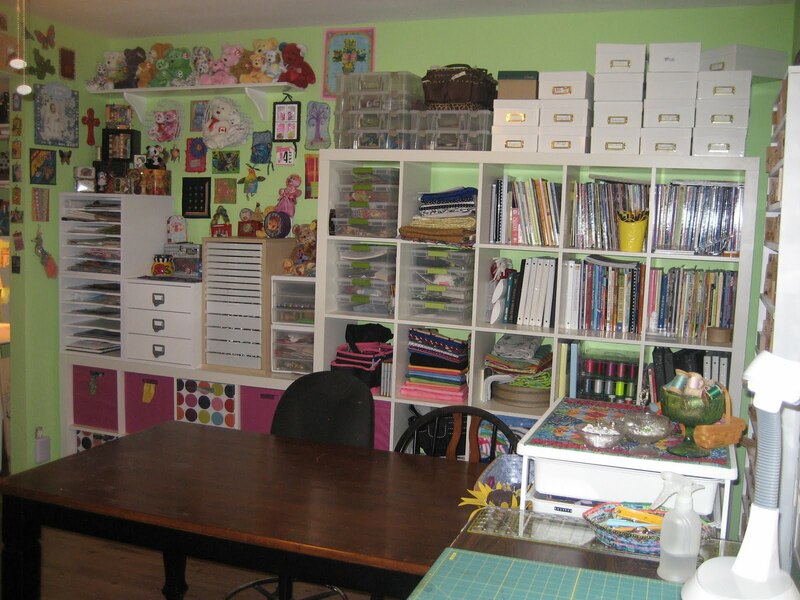 I have a fairly large room in the basement that my husband says is all mine. Now how to move my stuff in and be organized....hmmm. Your pics are very inspiring. Thanks.